Waltham’s annual appreciation dinner took place on Saturday night, seeing many honours and distinctions presented. From left: Fire Chief Larry Perry presents Gerald Chassie with a plaque for his years of dedication, after retiring from the force last year. 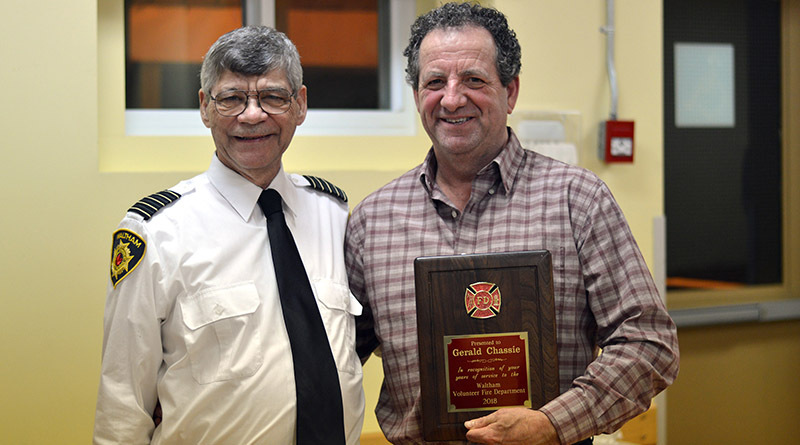 Saturday night proved bittersweet for the Waltham Fire Department, as members were recognized for their commitment to the community and they bid a formal farewell to a longstanding member who retired from the force in 2018. With over 35 years under his belt, the crew, local council, and town employees had the chance to wish Gerald Chassie a happy retirement, marking his service with a plaque and many a story, at the annual Waltham Appreciation Dinner.